This is the before of the other side. I removed the vintage scales months ago as I want my kitchen less cluttered. As you can see there is an open space above the cabinets. That will be framed up to the ceiling and trimmed. There is a foot of space there. The crown molding will be carried around the kitchen and breakfast room. The antique white cabinets will be painted white. Mr. Savvy said, "so we are going back to white cabinets". Yes, dear, we are. There is no way to make the new addition at the top match the antiqued cabinets and I'm tired of them anyway. We did the last update around fourteen years ago. The top will be trimmed out somewhat like this kitchen from BHG.com. I'm not positive the look the carpenter has come up with yet. I shared photos with him and he said he knows what to do. I know he does good work and can't wait for the change. The part I'm most excited about is having the refrigerator built in. I had to go way back in my kitchen posts to find one with the fridge showing because I always tried to not show it. The top cabinet will be framed out over the fridge and then panels down each side. The pot rack was fine for many years, but I'm ready for a more open clean look so that had to come down. Plus I have to climb up on a ladder to clean the crud off of it and climbing ladders in the future will cease at some point. The granite and back splash will stay as they will work fine with the updates. I have been looking at pendants to hang. One will take the place of the can light over the peninsula and one will replace the can over the sink. These were the two I have been deciding between, except the one on the right would have been bronze since the brass is no longer available, and I finally made my choice and they should arrive today! A friend said I should do chandeliers, but I am just not a fru fru girl and they would just collect dust and grease like the pot rack did. The pendant light will be easy to wipe clean. The Chateau Gray cabinets will stay the same color, but the glazing will be gone. I have been painting them most of the weekend. The new look is cleaner and less yellow. They can't be glazed any longer when the other side won't be glazed. The ceilings will also get painted and any touch ups to the walls. Fresh, clean, and more open is the look I'm going for and I can't wait to see it all done because right now I am living in one hot mess. Follow me on IG for first peeks. We spent the weekend refreshing a kitchen and dining area in a home in Ormond by the Sea. Thanks, Gee, I can't wait either especially for the kitchen to be clean again. With you and Mr. Savvy at the helm of this renovation, it will be magnificent....you have great plans for this room....and I think Mr. Savvy is right about the decision not to downsize...your home works perfectly for you two. Can't wait to see the progress. Look at you agreeing with him. I wanted less house and yard, but oh, well. I never decorate for Christmas until after Thanksgiving and I am hoping this is done before then. Thanks, Lory, yes never done! I don't know how true this is but my refrigerator stopped working this summer. Service man came out and fussed at me for not having enough airflow around the refrigerator. Mine isn't built in. Maybe call the refrigerator company that makes yours and ask. I had to get a new one. I think ours should be fine and it vents out under the doors on the front. I have seen most homes with the fridges built in now. How fun and I can't wait to see the finished project!! Enjoy the journey! Very excited to see how your carpenter finishes off the top of your cabinets as I am planning on doing the same to mine. I also wanted to downsize, but DH doesn't, so I am redoing my home in a style that makes me happy - modern farmhouse in grays, whites and wood (Fixer Upper style). This is also the first year I hired a gardener to help me close up my garden and it was wonderful. 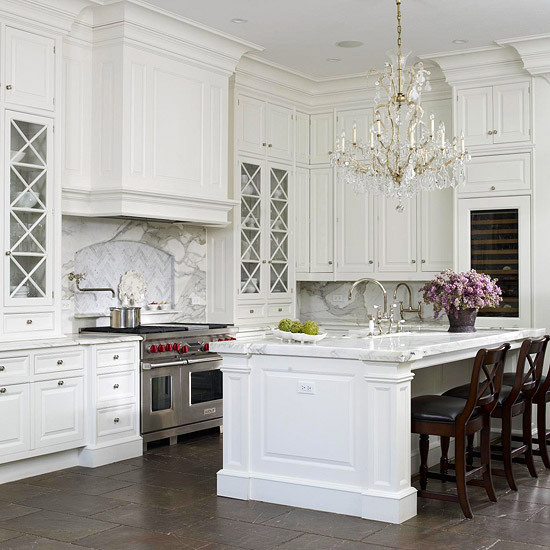 Kim your kitchen is gorgeous. I can't wait to see how you are kicking it up a notch! How exciting!! I can't wait to see the "after" photos!! So excited for you...can't wait to see your finished project! Hi Kim. 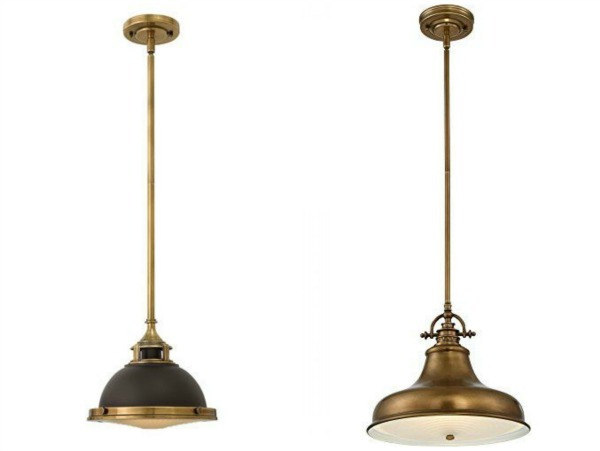 I am looking for a pendant light for over my sink and I really like the ones you posted. Would you share the manufacturer of the one on the right? Thanks! That is by Quoizel and called the Emery pendant. Love the plans ... will look fabulous! I know you're excited! We're getting ready to close the gap above our cabinets, too ... can't wait! So exciting! Can't wait to see it finished! Oh I know you are happy to be getting this done so quickly! It will look so good when you're done. This will be less stressful than moving for sure! It is going to look awesome! I'm starting on my kitchen now that my bedroom is so close to being finished. I can't wait to see what it looks like in the end. Beautiful I'm sure. It will be beautiful when finished....showed the blog to my husband his only comment was what kind of old car does he have? Typical me we have a 1947 chev and a 41 willys coupe. Janet, he has a 65 corvette that still needs work and he finished a 68 Camaro Z28 Rally Sport. He has also fixed up two newer pick ups. It is going to look wonderful Kim! I know what you mean about less clutter. Once we get to our new home (not the rental we just moved in to this weekend), I plan on having white cabinets. Love the lighting you have chosen. Love your kitchen. Your plans sound fabulous, can't wait to see it. I really love living here, but so miss SOME things from the old house. Have a great week. How exciting Kim!! You will love the changes! Light, fresh and bright! !Oh what a little molding and paint can do for a room!! Have fun!! Keeping the same color of appliances? I was wondering if you are going with Stainless steel. Will be interesting to see the final look. Keeping my white ones. Most of them are new. I'm just not a chandelier kind of girl either. I can just imagine all the dust to be cleaned on one. Can't wait to see your new kitchen. If he says "go", got to strike while the iron is hot! Change is always fun. I am doing a little updating in my kitchen as well. But I am planning on downsizing. I hate taking care of our home.It's too much Sq Ft for me to clean each week. Hoping to go much smaller in the next couple of years. So excited for all the changes Kim! I had my cabinets all to the ceiling too and love it! I did the same thing, Kim, when we were getting ready to sell this house. I just wanted fresh, uncluttered and clean. I like it so much that I don't think I will ever have a bunch of 'extras' again. I am glad hubby decided to downsize here-but we will see WHEN that happens with this market in this area. Lucky you getting a kitchen update. We have been looking at new stoves with the thought that we might do some changes in our kitchen. Wish we could enlarge it, but no where to go. I like the idea of taking the cabinets up to the ceiling. It's going to all be beautiful, Kim. Love the ideas and direction that you are going with in your kitchen. I badly need an update in my kitchen. Our cabinets are 25 years old thermal foil originally white (but faded now) and I don't think they can be painted. I updated with granite, a new sink and white subway tile about 5 years ago because a couple designers said our cabinets looked fine. I wish I would have ripped them out. I'd love to paint my kitchen a lighter color. If I could paint my cabinets a fresh white I think I would be much happier. I love your kitchen now but I can understand why you want to update. I have open cabinets on top also and as I get older, I don't want to climb up there to clean. Wow, sounds exciting! We built in our refrigerator when we did our kitchen remodel and I loved how it looked. Can't wait to see what you do. Your introduction to the "why now" and more is priceless! I love what you are going to do and cannot wait to see the finished reveal! May it go smoothy and swiftly! We've made the decision to stay put as well. We had held off on things like new appliances and refinishing wood floors thinking why spend the money if we're going to move? I also held off on new living room furniture thinking what if it doesn't fit in the new house. It's a relief to have made a decision, but it was a summer of doing the floors, new kitchen appliances (yay for counter depth fridges!) and all new living room furniture. I had a budget and stuck to it...haha, until the washer and dryer, hot water heater and garage door opening all pooped out in one month. Our house is 15 years old and these things just start to go. At least we'll be here to enjoy them. And think of the money saved on real estate commissions and moving costs. Your new kitchen sounds beautiful. Can't wait to see the pictures! I have tried to look up your new pendants, but it shows different model? Would you be able to give more information? Thank you! I can't wait to see what you're doing. I love the way you keep things fresh and you KNOW that I love your style! I agree with you about the pot rack. I am going to try hanging mine on a rail behind my cook top. I'm sure that they'll be a message but at least I'll be able to reach them. The changes are going to look awesome, so clean and much brighter! Would you mind sharing the color of your granite? Thanks! Thanks! The granite is Giallo Ornamental. Oh Kim, In my mind you had the perfect kitchen, but now that you're showing us your points for the remodel I totally see it. Are you changing the appliances? When I made the refrigerator enclosure I went for a less deeper fridge, counter width, which is way smaller, but made my small kitchen look more open. We had an extra fridge in the basement, so it worked for us. Can't wait to see all the changes coming to your kitchen, it'll be gorgeous! What a huge project! But it'll look amazing. I had noticed all the cabinets going all the way up to the ceiling in your inspiration post! Kim, I'm adore the trim at the top of your cabinets. I noticed your local - I'm just the next town over to you! 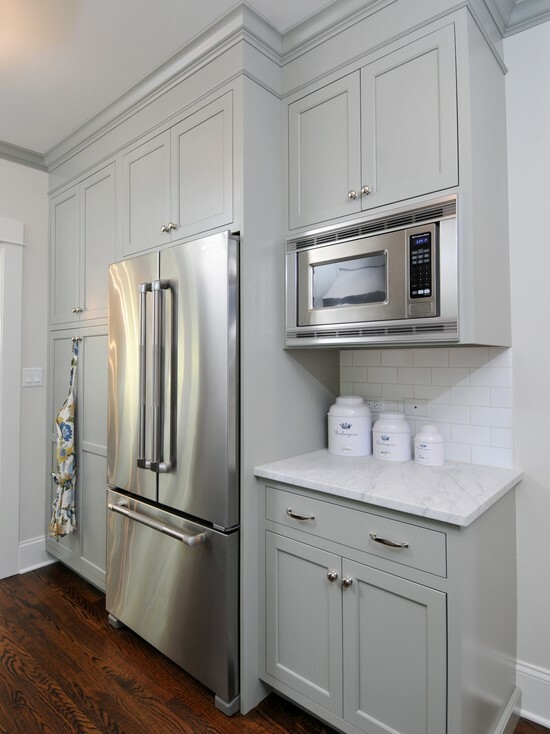 Would you mind sharing the name of the carpenter how boxed in your upper cabinets and boxed in your fridge? Stunning!